We need only look at the rapid advancement of knife technology and innovation to see that there is a demand for better, more efficient and effective weapons. In answer to this continuing call for inventive hardware, companies like Spyderco, Cold Steel, Emerson, Benchmade, Gerber, Ka-Bar, Kershaw and SOG are all diligently competing for the attention of the increasingly tech-savvy consumer. Just like all circular causalities, the more these companies invent, the more we seek the latest and greatest contraptions, and the more we buy, the more they invent. After awhile, this cycle takes on a life of its own, and may in fact derail self-defense practitioners from focusing on a much more important element to their combat preparedness--the need to develop personal skill and movement mastery. Upon reflection, we can see that all technology, no matter how impressive and efficient, is limited by the skills of the person wielding it. Let me be clear, I am in full support of any and all advancements that make knife and edged weaponry more user-friendly. However, let us not lose sight of the need to educate and train ourselves in the fighting arts. There is no replacement for a thorough understanding of movement and systems that is committed to muscle memory, able to be instinctively tapped into when an emergency unexpectedly arises. Unfortunately, it is often in our nature to seek out the easiest and most convenient pathways to our goals. People want to have self-confidence and assuredness that a dangerous scenario can be handled with graceful bad-assery. However, many cannot sustain the time and effort it takes to humbly and steadfastly pursue learning martial arts skills. The dream of combat preparedness doesn't die, but its outlet transforms away from training and learning and into mere material purchasing. I believe knife and gun manufacturers are not really selling technology, they are selling the illusion of expertise, but can expertise really be purchased? In the meantime, the consumer may be developing a false sense of self-assurance that could result in harmful outcomes if the cognitive and physical movement skills aren't also developed in tandem. Wouldn't it be better to have mastery of both from within and from without? I implore my students and followers to not be satisfied with merely owning the latest gadget. Certainly there are very cool and impressive knives and guns available for purchase, but there can be no substituting the quality of personal development on a cognitive, physical and spiritual level. Being an eager student who is continuously learning is a characteristic that can never be supplanted by a nifty tool. Only when one finds a balance between material expertise and internal expertise is one able to honestly claim to be combat-ready. Think about your own goals as a martial artist or self-defense practitioner, and conscientiously consume and pursue that which will get you closer to your ideals. In my perspective, when we attempt to supplant self-development with the latest gadget, we create gaping holes where enlightenment and skill should be endlessly growing. It is this mastery that I intend to teach with the launching of my new martial arts system, Extreme Defensive Tactics, starting this October. 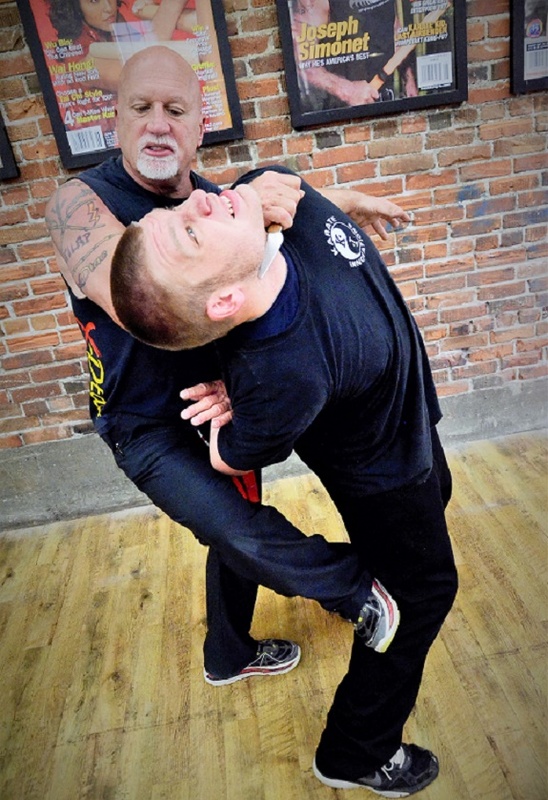 X-Dtac is a unifying methodology that simplifies and streamlines your self-defense movements into one easily learned and cogent system. There are multiple frames and ranges, but all draw upon the same core skill sets with multi-varied applications. This is a blending of the most essential elements from a vast array of traditional martial arts, which coalesces the strengths of each system and discards the excess. At Ki Fighting Concepts we rely on motor skills, muscle memory, and tool development based on probabilities, tapping into instinct and trusting intuition. Stay tuned for the launching of X-Dtac and in the meantime, be sure to invest at least as much in your learning as you do in your material acquisitions.